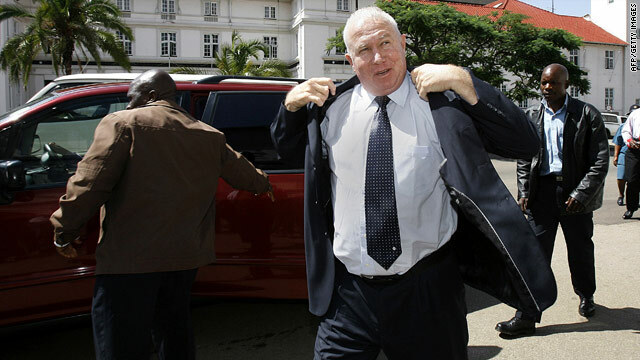 Controversial Zimbabwean politician Roy Bennett arrives at the Zimbabwe High Court on January 12, 2010. Harare, Zimbabwe (CNN) -- The trial of controversial Zimbabwean politician Roy Bennett took a new twist Tuesday when prosecutors told the judge they wanted to impeach their star witness. The prosecution called arms dealer Michael Peter Hitschmann to the stand to implicate Bennett in the procurement of the arms. Bennett is a senior official of the Movement for Democratic Change (MDC) and Zimbabwe's deputy agriculture minister-designate. He has pleaded not guilty to charges of terrorism and inciting people to carry out terrorism. He could face the death penalty if convicted. The MDC -- led by Prime Minister Morgan Tsvangirai -- says the case against Bennett is politically motivated and was aimed at keeping him out of the unity government it formed with President Robert Mugabe's Zanu-PF party last February. Under questioning from Attorney General Johannes Tomana, Hitschmann testified he had seen Bennett on television and then had met him at a public gathering. But Hitschmann told the fully packed courtroom that he was not aware of some of the weapons the prosecution claims that he bought with the financial support of Bennett. In addition, Hitschmann -- who appeared relaxed throughout the proceedings -- cast doubt on the authenticity of e-mails that were produced in court which the prosecution said had been retrieved from his laptop and which allegedly reveal that he and Bennett were planning to commit terrorism. "None of the contents was retrieved from my laptop in my absence or in the presence of my legal counsel (in 2006 when he was arrested)," he said, adding, "I don't know here they came from." After that, Tomana started questioning Hitschmann as if he were a hostile witness and not the star witness for the prosecution. Bennett's lawyers objected, saying the prosecution was trying to "confuse" people. At that point, Tomana indicated that he was in the "preparatory stage" to "to lay evidence that Hitschmann was being inconsistent." "The witness -- who is an accomplice witness by the way -- is getting to be a witness in favor of the accused; we are entitled to start impeachment procedures when the state witness starts showing that he is being unfavorably indisposed in favor of the accused," he added. Bennett's lawyer, Beatrice Mtetwa, said the prosecution had never indicated that it had e-mails which were purportedly written by her client and Hitschmann. She said Hitschmann had submitted an affidavit saying he does not want to testify against Bennett, adding that the statements about conspiracy that were purportedly made by him were done under "traumatic and unfriendly circumstances" in 2006, when he was arrested and later charged with terrorism himself. Mtetwa said the prosecution was attempting to take a statement Hitschmann made to the army and turn it into a statement against her client. "That is an army-procured statement. What legal basis is there to change it to a witness statement? The statement was made when he was an accused facing conspiracy charges," said Mtetwa. "During that time the prosecution did not indicate that he had acted in common purpose with the accused (Bennett)." Hitschmann was acquitted of terrorism charges in 2006 but served a jail sentence for the lesser charge of possessing weapons without a license. The weapons allegedly included six sub-machine guns and two machine guns, which the prosecution produced in Bennett's trial as part of the state's exhibits. The judge in the case, Justice Chinembiri Bhunu, who resumed the trial after adjourning it last November, is expected to rule Wednesday whether the state can proceed to impeach its own witness. Throughout the court proceedings, Bennett -- clad in a blue suit, matching blue tie and a light blue shirt -- sat motionless, gazing into the sky once in a while. He laughed out loud when Hitschmann said he first saw Bennett on television punching the justice minister in parliament.